The estimated 1.8 million anglers who fish Texas lakes and rivers each year have an annual economic impact of $1.49 billion. Texans spend more money on fishing than on any other outdoor activity. Fish stockings along with harvest regulations have been the primary techniques used by Texas Parks and Wildlife Department biologists to improve or maintain fishing quality. Hatcheries play a vital role in maintaining the quality of fishing in Texas. Fishing pressure on Texas fresh waters is tremendous. Stocking of hatchery-reared fingerlings helps keep the quality of fishing high. Texas Parks and Wildlife Department annually produces more than 7.5 million bass, 1.2 million catfish, 5.8 million striped bass and hybrid striped bass, and 1 million other species of fish for stocking into Texas reservoirs. The Texas Freshwater Fisheries Center houses one of five state fish hatcheries. Largemouth bass production is the primary focus of the hatchery, although other fish are also grown here. The hatchery produces 3 to 4 million Florida largemouth bass fingerlings annually. The TFFC hatchery consists of two main parts, indoor and outdoor. Indoor facilities include raceways for spawning, holding and treating fish, isolation and treatment tanks and fish health and genetics laboratories. Fish are grown to the desired size in 45 lined outdoor ponds ranging from one-quarter to two acres totaling 37 surface acres. A major function of the outdoor hatchery is the production of food for bass. In excess of 70 million koi carp (goldfish) are produced annually for this purpose. Catfish are fed high-protein pellets. The Lunker Bunker is a special part of the indoor hatchery. Visible through a bay window at the end of the hatchery gallery in the Visitor Center are 22 circular tanks. These tanks are used to hold largemouth bass entered into the ShareLunker Program. These tanks can also be used as quarantine or treatment areas for new or sick fish. The Lunker Bunker is officially known as the Intensive Care Unit because of the work that goes on there. 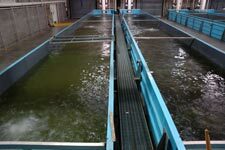 In the hatchery building beyond the Lunker Bunker are raceways, 15,360-gallon troughs used for spawning Florida largemouth bass as well as rearing channel catfish and holding rainbow trout for stocking. 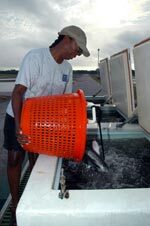 Every aspect of fish production can take place here, from spawning to egg incubation to grow-out. Male and female largemouth bass pairs are placed in raceways and given mats resembling artificial turf on which they spawn. The egg-covered mats are then removed and placed in raceways or holding troughs for hatching. After the young fish (fry) hatch, they are held in hatchery building raceways until they are big enough to be placed in outside ponds for further growth. Or they may be stocked into public waters as a part of the Inland Fisheries management program. The fish health and genetics laboratories support the work of the hatchery and the exhibits. In the fish health lab, problems and diseases are diagnosed. Water quality is also monitored to ensure that the fish are kept in a healthy environment. The genetics lab is important to the ShareLunker program, since fish must be genetically identified before being used as broodfish. 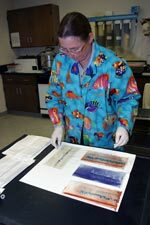 Traditional protein electrophoresis and a relatively new RAPDS DNA technique are used to identify the different subspecies of largemouth bass (northern and Florida). Water for the TFFC hatchery and exhibits is pumped from Lake Athens, filtered and treated with ozone. After being used, the water is returned to the lake. Maintenance of the massive filters and intricate plumbing is a major job for TFFC maintenance and hatchery personnel. For information on the overall TPWD hatchery program, click here.